This is the story of Afro-American Muslims who served on the side of the British the Anglo American war of 1815 who were resettled in Trinidad. The African-American settlement on the Hondo River. Let me just take about five minutes and talk very briefly about what it was all about and then we will go on to a film in which you will have an idea of the forested nature of the place and the sort of work we did and are continuing to do at Hondo River. So if I say African-American site in Valencia, if you hear people talking about the Hondo River Settlement, if you hear people talking about the Quarry River Settlement, these are all names that they use interchangeably. So the settlement consisted of a very motley bunch. First of all, African-Americans who had fought on the British side in the war of 1812 to 1815. The British having lost their colonies, their thirteen colonies in the American revolution decided that they were going to make a second attempt to retake these colonies and that is the Anglo American war of 1815. And so they went on the towns and the settlements of the east coast of the US, that is the British, and induced Africans, some slaves, some free, to join their forces in fighting against erstwhile masters. So that is one group of people from whom the forest settlement is derived. The other group are disbanded soldiers from the British West Indian Regiment which have been formed out of Blacks in the Caribbean, some of them bought, some of them rescued from slaveships after the banning of the slave trade in 1806. And these have fought in the Napoleonic Wars (1799 to 1815) when Napoleon sought to take control of Europe. A number of these British West Indian Regiment soldiers had been recruited directly from Sierra Leon so that’s the second group. That gives you an idea of the location of the place under heavy forest and one of the early leads I had was an article by Mr. Lawrence, who is here this evening, on these settlements. And taking off from that, I kind of combed through the records at the public records of London. I found these two very important documents: one from the Imam of the settlements Imam Abu Bakr and the other from Reverend Hamilton. Abu Bakr was asking Governor Woodford, “You all brought us here, you’ve set us up here, we are producing so much of produce and the bridge on the Quarry River has broken down.” I found that very interesting. And then I came across a letter from Reverend Hamilton saying that these Mohammedans, followers of evil in the place, [saying that] we have to get rid of them. And so with those leads, it must have taken us about six or seven years, and I was very delighted that Sharif Hosein, who is here this evening, was able to trek with me through the forest… and it’s really a very heavy forest. You know sometimes when you are looking at a film and you see [a] stunt that says, “Don’t try this at home.” I want to tell you don’t try this on your own, this trip into the forest, because it’s filled with mapepire, a lot of snakes. People tell me that those are the spirits of the African Ancestors guarding the place. These mapepire have got rid of all the other snakes. I think they have eaten up the other snakes and they are large and they are ferocious. Mr. Sharif Hosein is not scared of mapepire. He would say, “Doc. stand up, stand up, go back, go back,” and he would take his cutlass and go and you would hear, “Pling” and the Mapapee head gone. 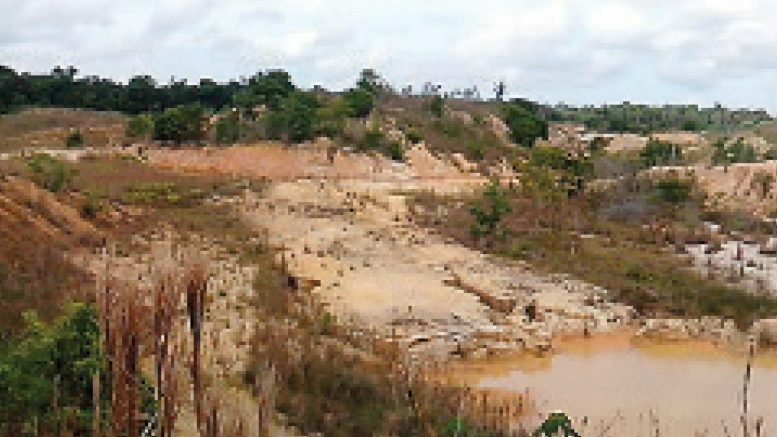 So I am saying if you are going there you have to be very careful because it is a haven of some of the most beautiful and the largest mapepire I have ever seen. So in the clearing of the settlement there is a very interesting interaction between the African Muslims and a few Baptists and the Nepoyo people from Arima who were hired by the British Government to assist in clearing the place. I suppose these people knew how to deal with mapepire and so on and so they cleared the place. And from the records I have seen, the Nepoyo people were very helpful and very corporative and they did not regard the Africans as interlopers – people just coming and taking over the place. As far as they were concerned, the earth belonged to everybody and not to us alone, so if you want to come here why not? Each single male was given eight acres of land; each couple given sixteen acres. They had to pay rent at one dollar and fifty-six cents per year. They were given plants and they were given tools. The Imam Abu Bakr was a senior sergeant because he had come, as most of these African American Muslims had come, from a military background. He was a senior sergeant headman and there were three other sergeants so there were four in all, Abu Bakr and his three lieutenants and four corporals. What are the numbers of people who came to this settlement in the forest? June, July 1819 two hundred and thirty-three men from the Third British West Indian Regiment, forty women and twenty-six children: a total of two hundred and ninety nine. February 1825 three hundred and seventy-six men, thirty-five women, thirty-four children. And in 1825, we will talk about the production later on with the various years, four hundred barrels of rice. These Africans were the people who introduced rice in Trinidad and Tobago. So they are producing rice, most of it was hill rice. But there was also some swamp rice because you know a number of African slaves were especially requested, the Guinea birds they call them; slaves from Guinea, because the slaves from Guinea, the Guinea birds had particular skills in planting rice so they were in high demand on the estates, on the plantation on the east coast in fact right down to Georgia. So these Africans brought those skills in rice, coffee, cocoa, yam and then the men complained there was a gender disproportion – too many men. And so in 1821, fifty-two liberated women from Antigua were brought, and the word is that they were distributed among the men. So Reverend Hamilton from Tacarigua decided that he was going to work on the community. 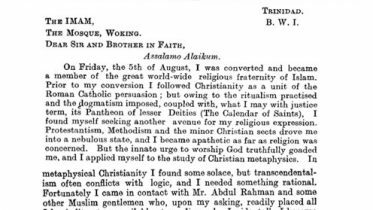 And in one of his letters in 1841, he says that he conducted eighteen marriages and fourteen baptisms meaning converting people from Islam to Anglicanism. Then in 1840, another letter from Abu Bakr complaining about the conditions of the roads. So I want to end on this section now to talk about the significance of this Islamic Settlement with a few Muslims and Baptist brethrens. They are among the first producers of agricultural produce for Port of Spain, Arima and Sangre Grande: rice, yam, ginger, corn, peas, cassava. They were very instrumental in opening up an area that the British wanted to open up, that whole eastern coastal area. When these Muslims left the settlement they went and they settled in areas like La Seiva, Toco Road and along the Manzanilla Road. So they assisted in the opening up and peopling that area. They were among some of the Anglican converts in Trinidad and I think what is equally important is that these were the people who formed the beginning of the Trinidad and Tobago Police Force. Because of the fact that many of them were soldiers, they had military training; they had military discipline. They were first lured out of the forest settlement to be guards, to be policemen for the Stipendiary Magistrates who had to travel throughout Trinidad and Tobago to look at how the slaves laws were being operated and to which advantage was not taken over Africans. It was particularly after 1838, these people were the logical choice because of their military background. So in a significant sense, we can say they were the early core of the Trinidad Police Force. Be the first to comment on "The 1815 Islamic settlement on the Hondo River"